This space is dedicated to brainstorming and staging future changes to the Academic Guidelines. In order for these changes to be added to the frozen guidelines, mutual agreement must be reached, the version number will increase, and all those who have signed the guideline will receive email notification. https://uwaterloo.ca/research/sites/ca.research/files/uploads/files/crowdsourcing_guidelines_access_check_done.pdf - U Waterloo's guidelines include advice to offer a token payment but not a very high payment to avoid workers working strictly for remuneration. (!) Clearly violates the guidelines. We hope you find the guidelines useful. Add a template for reporting the use of MTurk in academic articles. This could instruct researchers to report the number of HITs, the number of Turkers, how long their tasks took, how much they paid, etc. Edit the template for contacting researchers and invite them to sign the guidelines at the end. If you've spent time talking with Turkers, you probably know that academic requesters have been a continuous source of strain. Research surveys with horrendous pay and arbitrary rejections are common. Despite Mechanical Turk's attractive availability, a large number of researchers make innocent missteps and cause serious stress. Recently, the tension came to a head on Turkopticon. An IRB-approved researcher experimented on the platform unannounced. The result was Turker confusion, strife, and wasted time, in a system where time is what it takes to make ends meet. Before the guidelines, Turkers would deal with research problems on a case-by-case basis through e-mail or by calling human subjects review boards (e.g. IRBs, HRPPs) for help. These guideline make Turkers' expectations and rights available in advance to mitigate these tensions from the start. 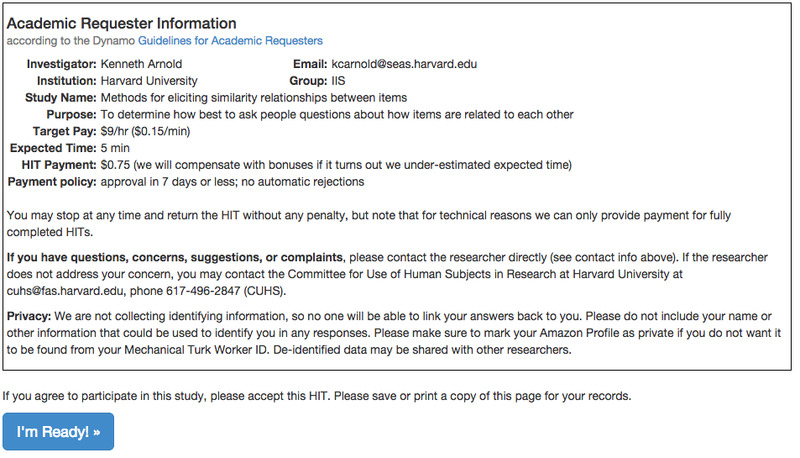 They address how to be a good requester, how to pay fairly, and what Turkers can do if HITs are questionable. They apply to Turkers both as experimental subjects or data processing workers who fuel academic research. We'll publicly maintain these guidelines so IRBs and researchers can easily find them, and Turkers can easily point to them in advocating for themselves. They were developed over several weeks, and have been circulated and debated by workers. Lots of Turkers have been signing it to show their support. As a requester, you are part of a very powerful group on AMT. Your signature in support of this document will help give Turkers a sense of cooperation and goodwill, and make Mechanical Turk a better place to work. Today is Labor Day, a US holiday to honor the achievements of worker organizations. Honor Turkers by signing the guidelines as a researcher, and treating Turkers with the respect they deserve. If you have any questions, you can email them to info@dynamo.org or submit a reply to this post. This page was last modified on 21 July 2015, at 04:45. This page has been accessed 82,501 times.